Nestled on the Oregon coast is a small town of rocky beaches and rugged charm. Locals love the land's unspoiled beauty. Developers see it as a potential gold mine. When newcomer Hank Cooper learns he's been left an old friend's entire beachfront property, he finds himself with a community's destiny in his hands. Cooper has never been a man to settle in one place, and Thunder Point was supposed to be just another quick stop. But Cooper finds himself getting involved with the town. And with Sarah Dupre, a woman as complicated as she is beautiful. With the whole town watching for his next move, Cooper has to choose between his old life and a place full of new possibilities. A place that just might be home. I'm a HUGE fan of Robyn Carr's Virgin River series and I was so excited when I found out she was starting up a new series set in Oregon in an oceanfront community. I can't think of a better setting. 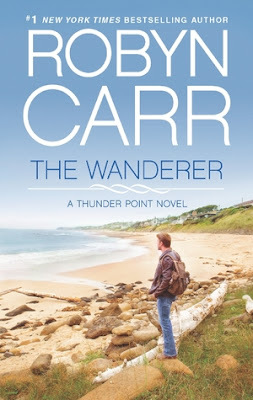 Author Robyn Carr is introducing us to the town in The Wanderer. This isn't just one couple's story. We get to know so many of the town's inhabitant's. Not just their names either, but who they are. What their back stories are. I'm guessing so we can get to know them more in the future as well. I really loved this. It made for a well rounded story. I also feel emotionally invested. I know these people now. I have to pick up the next stories to see how everyone is doing. That's a master writer for you. As always, in a Robyn Carr novel, there are military personnel. Retired and present. There is something so all American it. She does a good job of bringing them to the forefront. We should be remembering our troops. They all have lives like this. They have families and loved ones back home. But, I absolutely loves adding The Coast Guard. I used to date a rescue swimmer and the job has always fascinated me. Now, we have several romances going on here. It was alike bonus material in every chapter! Couples hooking up left and right. I loved it! Love is in the air. And there is no shortage at Thunder Point. I was most connected to Mac and Gina's story. I don't know why, but I just felt a personal connection with them. I can't wait for more of their story. The Thunder Point series gets two thumbs up from me. It was so much more than I was hoping for and it scratched my itch for something romantic on every level. It was a completely relaxing book. I can't wait to get back to Thunder Point and read more! Seriously - I cannot tell you how much I loved this one! Great review! Great review...I posted mine yesterday. I just loved this story. Last year I challenged myself to read all the Virgin River books and was so bummed when I got to the last book. At least now, I have this series to look forward to! Are Beta Readers Doing Their Job?